First off, sorry for that lack of my face on the blog lately, I wanted to get an outfit post up today but my face was just having none of it. 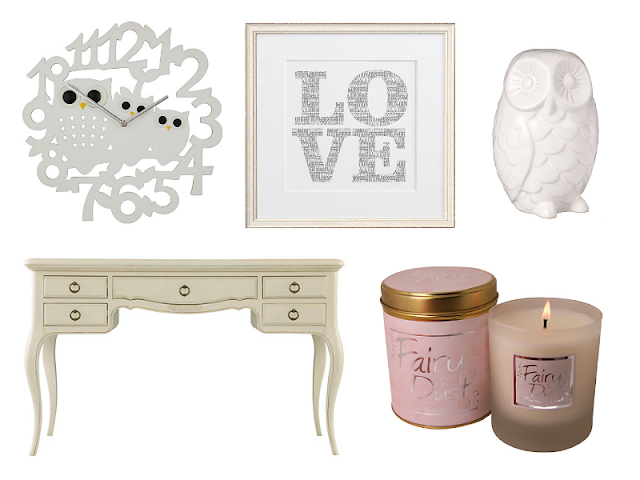 So today, I decided to do a homeware post. I've been looking at homey bits a lot lately and I thought I'd share them with you. I've always pictured a fairytale style bedroom with a huge bed with pretty bedding, a lovely white dresser, like the one above, with a big mirror, a fancy chair and space for all my makeup. Perhaps a revamp with some colour paints. A girl can dream! As well as the dressing table, (which is a bit of a pipe dream at the minute!) I've been loving little home accessories. I think the clock is so cute, even though it'd look totally out of place in my current bedroom! The Love artwork is really simple but cute and the little owl is just adorable! I've seen a lot of people with ceramic owls on dressing tables and things and while it has absolutely no point whatsoever other than to look cute, I still really want one. I really love lilyflame candles too, my mum has this one and it smells beautiful. I'd never seen them in the larger size before though, only the small tins. I really like the glass jar though, it's so pretty! I actually really like doing slightly more lifestyle posts like this sometimes, let me know if you'd like to see more of them! I love all the things, I really would love the print, great piece to put on the wall. awe those fairy dust candles are adorable! i've always wanted a makeup vanity in my room but there's a lack of space!